Vice President Amissah-Arthur (right), interacting with Sheikh Osman Nuhu Sharubutu. Vice President Paa Kwesi Amissah-Arthur has urged Ghanaians to tolerate various religious faiths in order sustain peace in the country. According to him, there was the need to appreciate the different faiths in Ghana in the wake of religious attacks and violence in the sub-region. 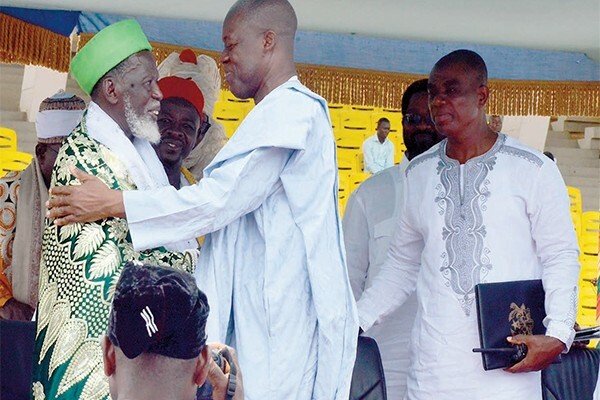 Mr Amissah-Arthur, who was speaking at the 2015 Eid-Ul-Fitr prayer at the Independence Square in Accra, said Ghana stands for religious tolerance which must be upheld by all. He asked Muslims to continue to pray for a peaceful and united country. “We continue to give thanks to Allah for a peaceful, stable and a united Ghana. On a daily basis in our communities and workplaces, we exhibit tolerance and appreciation of our different faiths and show that we care about each other’s welfare,” he said. He added that government was concerned about the long-term viability of the country’s economy to provide livelihood for citizens. “The sacrifices, patience and prayers are producing the expected results. This year we are experiencing an improvement in economic circumstances. We are therefore confident that the programmes and projects and the measures we are implementing will continue to yield good results,” he said. Touching on the Ebola virus, he stated that “the success in controlling the spread of the virus is for all of us to share but we have to resist the danger of complacency. “Ebola has not been fully eradicated therefore we need to maintain our vigilance and implement the measures proposed by the health authorities to prevent any outbreak in our country. “Ghana discharged its duty to the global community by providing a site for the United Nations mission for Ebola emergency response to coordinate the international response for the Ebola threat. In addition, Ghana contributed 42 health professional to assist our brothers and sisters in Liberia to battle the virus,” he said. He assured Muslims that measures had been put in place to effectively organize this year’s Hajj. National Chief Imam, Sheikh Dr. Osman Nuhu Sharubutu prayed to Allah for peace, unity and tranquility in the nation, admonishing both Muslims and Christians to live together in peace.